Which Animal Sticks Out Its Tongue to Show Anger? Sticking out your tongue says a lot about how you're feeling. Unless you're a little kid making faces for fun, it can say you're stressed, angry or just don't like the situation you're in. What body language specialists call a "tongue-show" is a sign of irritation in many animals, as well as in people. Wanna see mad? 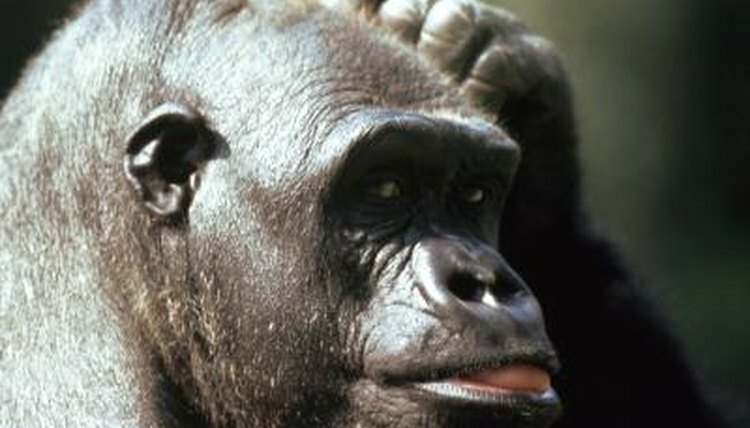 Next time you're at the zoo, if a gorilla looks at you, stare hard and long, and then stick out your tongue. No guarantees, but you may just get a reaction. Staring is aggressive to them, and showing your tongue should really push the button. Better to do this behind glass or move out of range, though, because gorillas are known to throw things and have a limited selection of ammunition, so if they throw something, it could be gross. Llamas have short tongues -- so short that a new mother can't even give her newborn a first bath. This does not mean, however, that they can't use them expressively. Female llamas stick their tongues out when they get crossways with each other. If the argument escalates, a spat can turn into a spit. Llamas can spit evil-smelling semi-digested food as far as 15 feet, but this expression of extreme pique is mostly shown by females, as the males would rather just get basic and duke it out. Like many reptiles, iguanas use their forked tongues to pick up scent particles from their environment in order to identify things around them. They can also use them to express emotion. An agitated iguana may open his mouth wide and flick his bright pink tongue rapidly. If this attitude expands to include altitude, with the iguana "walking tall" on straight legs, and you hear a hissing sound, it's time to sound "retreat" and vacate the immediate area -- he's ready to go to war. Attacked by a bird? Really? How bad can that be? Plenty, when the bird weighs 15 to 20 pounds and is bent on your destruction. Geese are always ready to defend what's theirs, be it territory or babies, and they have weapons that are up to the job. Besides flogging wings that can hit repeatedly and hard enough to break bones, a goose has a hard, serrated beak that can draw blood from human skin. An angry goose, mouth open and tongue stabbing the air viciously, neck in a low serpentine and hissing, honking and sounding the alarm is enough to unnerve an intruder, which is why a gaggle of geese makes a good substitute for a watchdog. Can you say "geese police"?